Note 1: Like Neo Geo games? Check out my reviews of Sengoku 3, Football Frenzy, Dunk Dream, Neo Bomberman, Super Dodge Ball, King of the Monsters 2, Battle Flip Shot, and Shock Troopers: 2nd Squad! Quick History: Nightmare in the Dark was published by Gavaking/Eleven and released for the Neo Geo MVS (arcade cabinet) in 2000. Like several other games, it was never released for the Neo Geo AES home console. 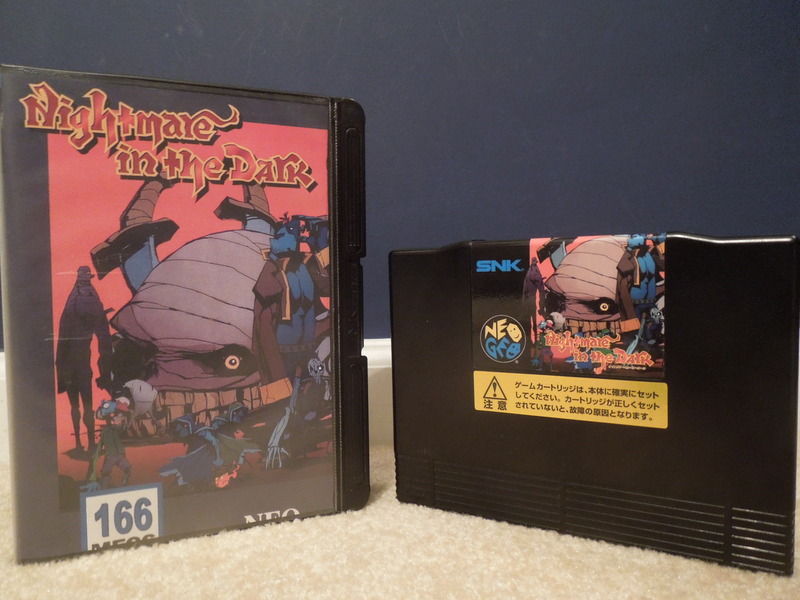 This copy of Nightmare in the Dark is a Neo Geo AES conversion of an MVS copy of the game. Memory Card Support: Yes. After losing all of your Credits, or choosing not to continue after losing a life, you can save your progress, and continue later at the exact stage you left off on. 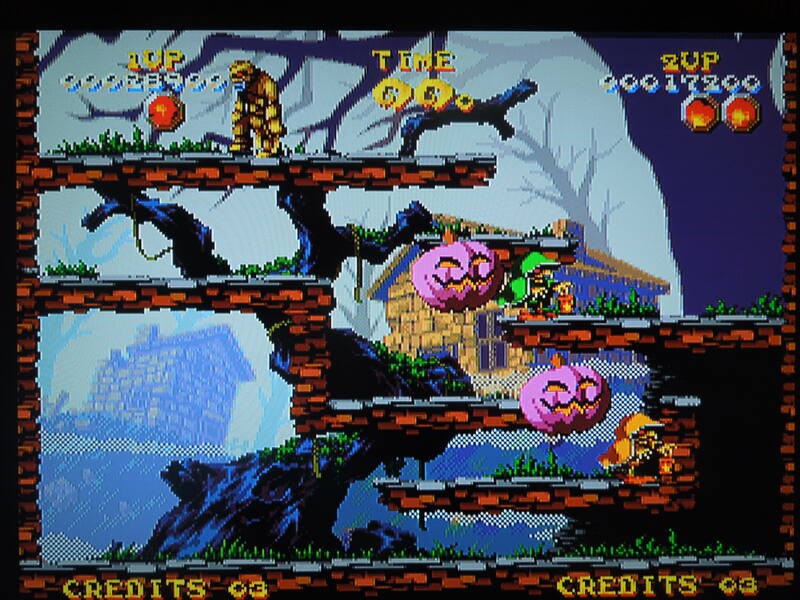 AES settings: When played on the AES, the game gives you a limit of 4 Credits per player. You get one life per Credit. Also, your character has a health bar, and he has to be hit 3 times before losing a life (Credit). You cannot alter the difficulty, and I believe the difficulty level is pre-set to Normal or perhaps MVS (Arcade) difficulty. Story: Your character(s) is a gravekeeper, and his task is to keep the cemetery free of ghosts and ghouls that have recently been showing up. Gameplay: Guide your gravekeeper through 5 single-screen-platforming Worlds (with 5 stages each), battling ghosts, zombies, and all sorts of evil creatures. Your gravekeeper attacks these creatures with his lantern, which he is able to shoot small fireballs from. Once he sets a creature on fire (with multiple small fireballs), the creature becomes a massive round fireball, which can then be used to roll at other enemies in order to kill them. Once all the enemies are eliminated from a stage, you advance to the next one. At the end of each World, you’ll fight a boss, whom you attack in the same way – light smaller enemies on fire and hurl the huge fireball at the boss. Turn monsters into great balls of fire and hurl them at other monsters. Control: A or C shoots a fireball from your lantern, as well as rolls a massive fireball once you acquire one. B jumps. You can jump up to any platform in the single-screen stages, but you cannot jump down. 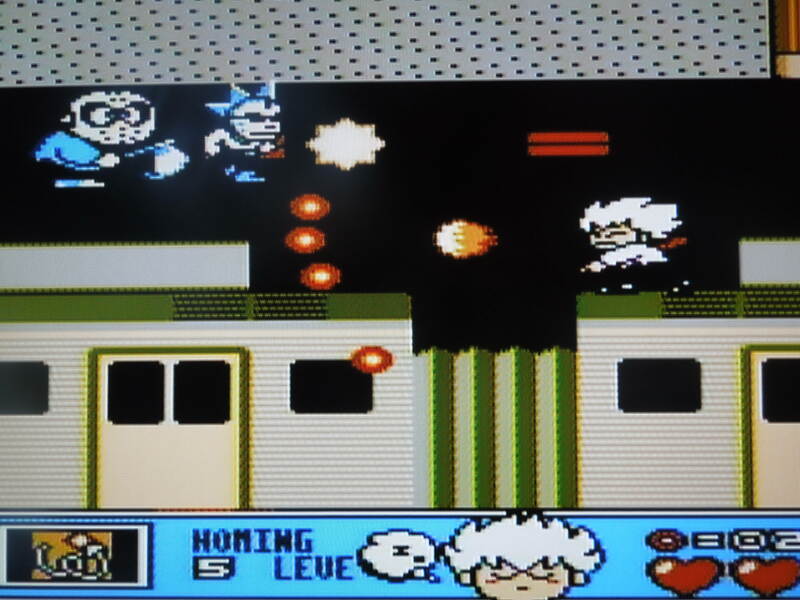 However, some stages have ‘holes’ on the bottom platform of the screen – falling through these transports your character to the top platform on the screen. Select pauses the game. Items: As you destroy enemies, you’ll release potions that can boost your gravekeeper’s abilities. Red potions (Fire Up) allow you to transform enemies into rolling fireballs faster (by having to throw less small fireballs at them before they transform), yellow potions (Range Up) allow you to attack from further away (your small fireballs shoot further across the screen), and blue potions (Move Up) allow you to move faster. In addition to potions, you’ll pick up different-sized diamonds and treasure chests, all of which boost your score, and have a ‘points-multiplier’ effect if you continue to pick them up without having been hit by an enemy (picking up additional potions when you’re already powered gives multiplier points as well). Getting hit even once will cause you to lose any abilities you’ve acquired or points-multipliers you have in place, so learn to avoid enemies at all costs. Additionally, when you beat a boss, he’ll release a meat ‘Life Up’ item that restores 1 bar of health to your health bar. Timer: Each stage is timed, giving you between 60 and 99 seconds to beat the stage. You’ll rarely run short on time, however, and typically finish a stage in half the time that’s present at the start of the clock. If, however, the clock does hit zero, then a Purple Jack-O’-Lantern (or two Purple Jack-O’-Lanterns if you’re playing with two players) will descend from the top of the screen to try and attack you (you can’t attack it, either). 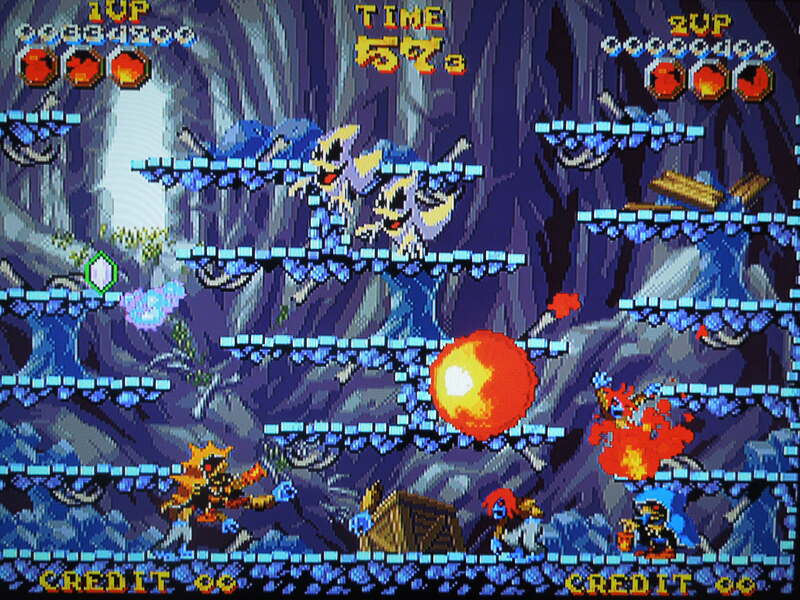 The Jack-O’-Lantern moves really, really slow, however, and is easy to avoid while you clear up the other enemies in the stage. If the Jack-O’-Lantern does hit you, however, it only takes one of your health bars away, and then it flies away, resetting the clock to its original time in the process. 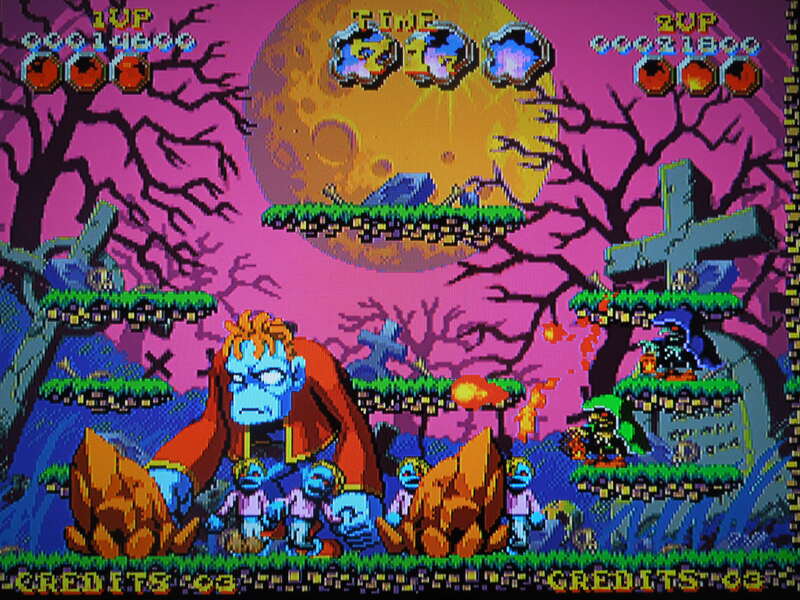 Beat each stage before the clock expires or the dreaded Purple Jack-O’-Lantern will come for you. Music and Sound Effects: You would expect the music for a game with a title like Nightmare in the Dark to be creepy, but it’s not, at all. The music is a type of light jazz that I actually really, really enjoy. Each World has a different sound track, and the boss fights have their own track as well. I particularly love the track for World 2. The sound effects, while there aren’t a lot, are satisfying. Your fireball attack, jumping, and item collecting all sound appropriate. Difficulty: As I mentioned above, the difficulty for Nightmare in the Dark I would categorize as Normal. With a bit of practice, you can breeze through Worlds 1 and 2, and still make it all the way to Stage 3-5 before taking a hit – the boss of World 3 is a tough challenge. I love that the AES settings are defaulted to 4 Credits, as this presents a great challenge for trying to beat the game. *Note: Holding B or C or D or A+C or B+D before pressing Start at the game’s intro will change the color of the cloak of your gravekeeper – his default is Blue, but this allows you to have a red, green, yellow, orange, or dark-purple-cloaked gravekeeper. 5 boss fights await, with the first couple being quite simple. Conclusion: I’ve read elsewhere that Nightmare in the Dark has a lot in common with games like Bubble Bobble and Snow Bros. However, I’ve never played those games, so I can’t give an adequate comparison. What I can tell you is that Nightmare in the Dark is a really addictive single-screen platform game. The real point of the game is in setting a high score, and that gives the game a ton of replayability. I spent a few hours on it, trying to get my score as high as possible on 1 Credit (your scores resets to zero after every Credit), and managed to make it to Stage 3-5 before dying, having gotten over 4 million points. Like most Neo Geo games, the memory card won’t save your high score, so go with the tried-and-true notebook or dry-erase board. The game is amazingly short, and you can easily breeze through it in approximately 20 minutes. The length doesn’t hurt the replay value, in my opinion. Sure, more stages would have been great, but the gameplay is so fun it serves as a good counter-balance. 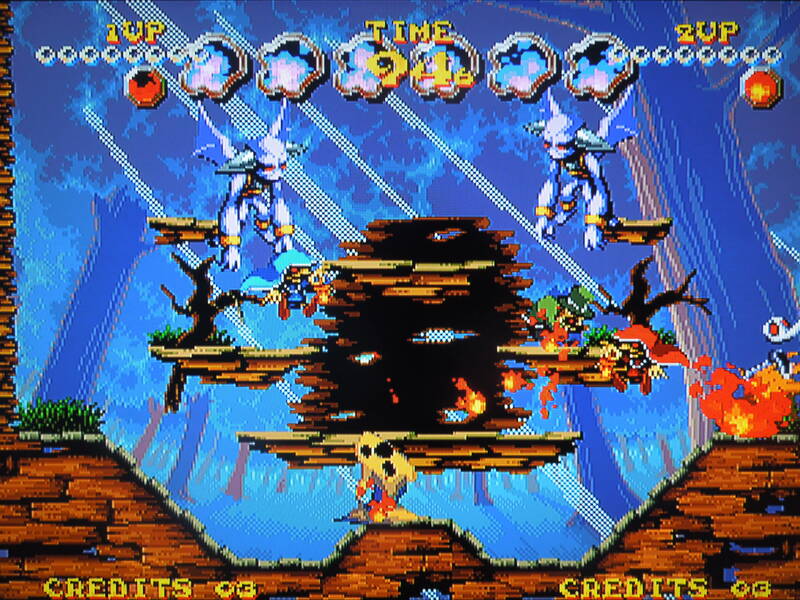 Co-op is fun too, as you work together with a friend to beat stages, and you can also compete for the high score as well. This entry was posted in Neo Geo - Nightmare in the Dark and tagged Nightmare in the Dark Neo Geo Review. Bookmark the permalink.